STAR RAIDERS. When Atari decided to re-release games from their back catalogue we created a web-based documentary series to support this. This series, called ‘Atari Classics,’ has each episode focusing on a specific classic Atari game title, featuring interviews with the original developers on how the game was made, as well as archive and commentary that attempts to go a little deeper into why the game is still regarded as a classic landmark title. This episode focuses on ‘Star Raiders’ and legendary programmer Doug Neubauer who explains how the game (which turned out to be one of Atari’s best-selling titles ever) was developed simply as a scientific curiosity during lunch-breaks and evenings. Doug wanted to see if a game like ‘Star Raiders’ was actually possible, a game that allowed you to go where and when you wanted. 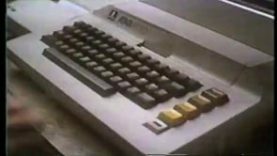 The game went on to be the main reason that Atari’s recently launched ‘Atari 800’ home computer was a smash hit, with people buying it simply to play ‘Star Raiders’!